Every April thousands of poetry writers all over the world participate in a writing adventure called NaPoWriMo (National Poetry Writing Month). A different inspirational prompt is issued each day. Poets can share their poems, if so they choose, on the many forums created to that end. There is a Singapore version of this event, SingPoWriMo. Singlit Station, which organises the project, is launching with an opening party TODAY, March 31, at 6:30 at BooksActually, 9 Yong Siak Street, Tiong Bahru, Singapore 168645. Supported by Arts Fund, SingPoWriMo is moderated by renowned Singapore poets, such as Alvin Pang, Pooja Nansi, Desmond Kon Zhicheng-Mingde, and Joshua Ip. SingPoWriMo is free to join. There is no penalty for not completing the 30 poems, and the event is mostly about giving poetry a chance in our busy lives, and, if desired, sharing the results of our effort within a supportive community. 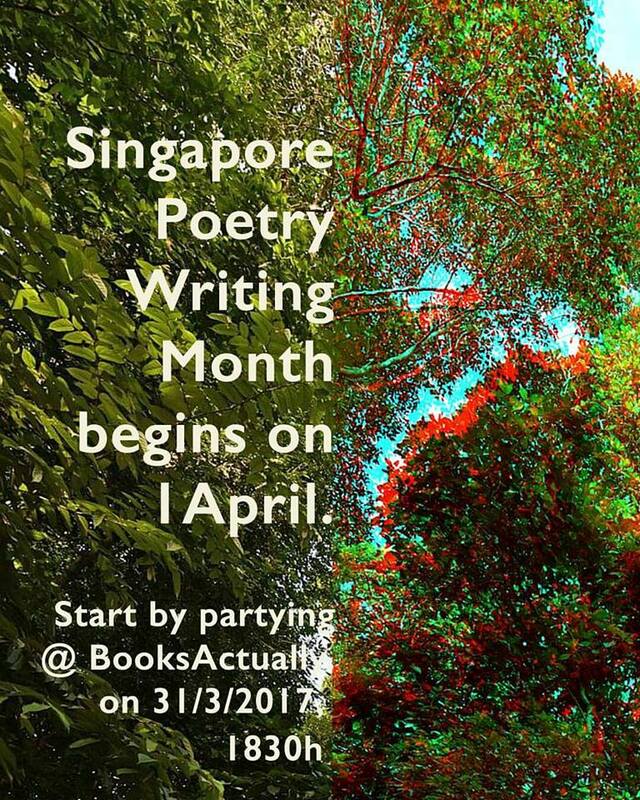 This local version of NaPoWriMo has some unique features: it is locally moderated; the prompts are tailored to the Singapore context. There will also be some unofficial awards. 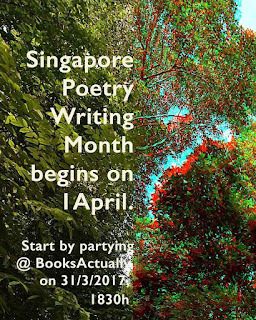 An anthology of selected SingPoWriMo 2017 poems is planned for later in the year. This will be the fourth SingPoWriMo anthology. The first one was published in 2014, when there were 400 participants, and 30 poems were published. Last year, in 2016, 2500 writers participated, and 165 poems were published. No doubt SingPoWriMo will grow again this year, and hence so will the anthology. The anthologies are available at the BooksActually website. Interested? Request to join the SingPoWriMo Facebook group, and get those creative juices flowing. Happy writing.